There are so many great sewing machines out there of different makes and models from Brother to Singer, Janome with all of them having so many different options. How do you choose which one to buy when you are wanting to jump up to the next level of sewing? In this post I will look at some of the options out there and decide which one I think is the “best sewing machine for the money”. Before we begin I’d like to touch on what I think constitutes a good all-around sewing machine. I look at many different factors including reliability, ease of use, durability, quality of workmanship and of course its price. The top three I recommend include the Singer 7258 Stylist, the Janome Magnolia 7318 and the Brother cs6000i. 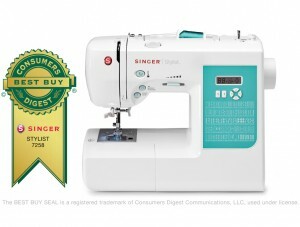 The Singer 7258 Fashion Stylist computerized sewing machine comes with 100 stitching options, 10 presser feet, a how-to DVD and is also a winner of the Consumer Digest Best Buy award. This quite simply is the best choice at this price level and I cannot say enough about this machine. The 7258 runs exceptionally smooth and will trick you into thinking that you spent well over $1000 on it. heavy duty metal frame that stops you from skipping stitches. Quick start DVD will have you up and running in 5 minutes! Even if you are a first-time sewer, this machine can work for you. The adjustable speed controller allows you to slow down the stitches per minute until you get more comfortable. On faster machines the fabric can fly through and become intimidating which you don’t want if you are just starting out. With this speed controller it will allow beginners to grow into more advanced users in no time. Setting this machine up is a breeze. I had it running in less than 5 minutes. The included Ready! Set! Sew! DVD is also helpful even though it isn’t really specific to this model. If you are looking for a perfect machine that is suitable for all levels of users I highly recommend the Singer 7258 . 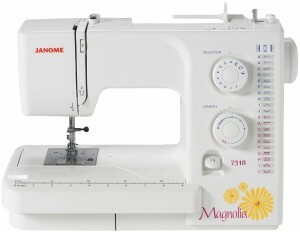 The Janome Magnolia 7318 is also an excellent choice for an all-around sewing machine. This model is not computerized like the other models reviewed in this post, but some people prefer the ease-of-use and reliability that comes with a electrical dial sewing machine. If you want a simplicity, you can’t compare with the simple dials on these machines. That is not to say that simple means less functionality, as the 7318 has plenty of it. The 18 built-in stitches that is plenty for most people, but may have you longing for more if you are a more advanced. This machine is a pleasure to use and runs like a professional machine that would cost much more. The bobbin is a pleasure to work with as it just drops into the hole next to the presser plate. No need to struggle changing them and the see-through bobbin container is also nice so you can monitor how much thread you have left while working. It is also a fairly light-weight machine that can be carried around, but isn’t so light that it bounces around while sewing causing you to skip threads. If you are partial to Janomes (like I am) and don’t want a computerized sewing machine then this machine is a nice choice. It is durable, light-weight, sews great and is affordable. Normally this machine would not be on a list of the best machines for your money. Mostly due to the fact that it normally retails for $450.00. However, I have included this machine because it has quite often gone as low as $150 on Amazon , which is a steal of a deal for this great sewing machine. 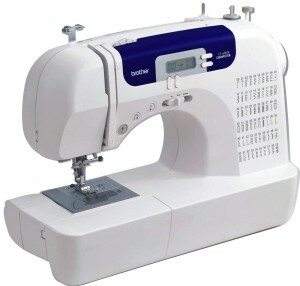 The Brother CS6000i computerized sewing machine offers 60 built-in stitches, 7 buttonhole styles and 9 presser feet. The oversided table is also a nice touch and allows you some flexibility and extra space when taking on larger projects like quilting. Overall this is a very nice sewing machine. The adjustable speed control makes it a good choice for the experienced and beginner alike. If I was to purchase another computerized sewing machine I would definitely consider the Brother CS6000i sewing machine. Especially if it was still at the $150 price point! Pretty tough to beat this model at that price. It is a tough choice between the three machines listed above, but if I HAD to choose I would most likely purchase the Brother CS6000i . However, this is mostly due to the great sale prices that you can find for that machine right now. The Janome 7318 is an outstanding machine, but is a bit more expensive than the CS6000i. The value you get for the Brother sewing machine is really tough to beat. If you are looking for other sewing machines that are geared towards beginners, I review a number of the top beginner machines in a post here.